Ever since I figured out how to make a hat (in the beginning, I kept churning out Lion Brand Homespun Pancakes and could not figure out what I was doing wrong) they’ve been one of my favorite things to design and crochet. First off, many times, there’s no foundation chain. They take a minimum of yarn, and generally just a few hours to make, so if you want to try something new or trendy, it’s not a huge commitment. At some point I knew I’d have to design bigger projects for people to “take me seriously” (*hah!) but clearly I still have a big soft spot for hats. 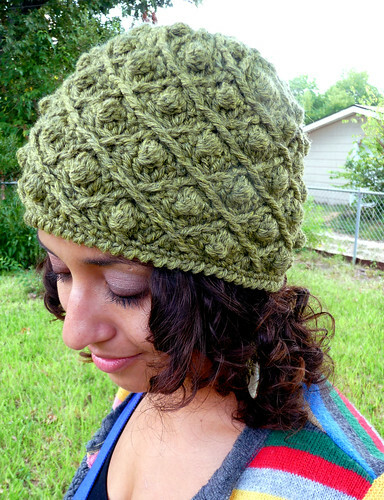 Last week, I released the PDF (in US Terms) of my Artichoke Hat, which was originally published in Inside Crochet. I love this hat, and unfortunately a lot of errors slid through to the original publication, which probably turned off more than one crocheter. So, I put it through rigorous testing and re-edited it, (and turned it back to US terms)–and now that six different people have made it and reported back to me (thank you!!! ), I am confident that all of the kinks have been worked out. They happen, I hate when they happen, and I try to correct it when I can. 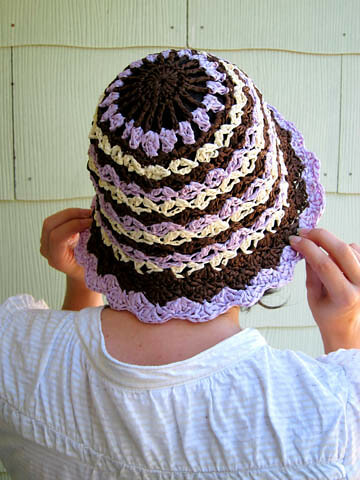 This is a great pattern for a intermediate/advanced crocheter, and I hope you’ll give it a whirl if you’re into bobbles and cables. It’s engaging, so save it for time when other people won’t be distracting you. The good thing is you’ll always be looking at the cable side when you do the post stitches, so you don’t have to confuse yourself with any back post stitches or uncertainty about where they end up. 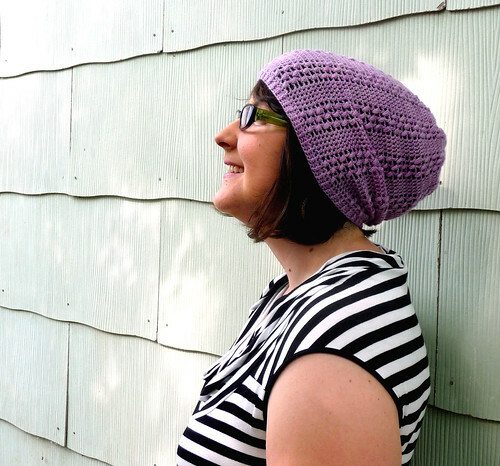 I also re-released my Lace Slouch Hat which originally appeared in Knit Circus. I love, love, love this hat. It is so soft and light and I can actually wear it in Texas. I’m looking forward to that. I kind of want to make it again in yellow, like this raveler did, and I’m also eager to try it in a lightweight sock yarn, because I think that would work too. One day! This one is worked bottom up in an easy to memorize pattern, and you can make it a beanie or a slouch hat, depending on your preference. Slouch is shown above. And just in case you’re on the other side of the world…. I also re-released my Summer Sun Hat. This was one of my first PDFs and needed some re-working, but thing that motivated me to do it was we actually got tons of new paper (!) yarn in at Yarnivore. So Tammy agreed to stitch it and I agreed to tighten up the pattern. It’s so nice to have a paper yarn source where I can actually see the colors in person– I’m itching to try a purse with it, when it gets hot again. Which, around here, won’t be too far away. So what about you, dear readers? Just out of curiosity, what’s your favorite thing to crochet? I enjoy making scarves and hats as well because they don't require as much yarn, and there is less chance they end up unfinished indefinitely (as often happens to me with larger, more complex projects). Near-instant gratification! yay! thanks for the mention! :) made my day! I love your hat patterns. I've been eyeing some skeins of Malabrigo Lace and now I know what to make with them. Hats are my favorite things to crochet too, with blankets a close second. I love a good round blanket when I have a chance, but it's been a while since I crocheted one.